This chapter explains the concepts of and the differences between reference crop evapotranspiration (ETo) and crop evapotranspiration under standard conditions (ETc) and various management and environmental conditions (ETc adj). It also examines the factors that affect evapotranspiration, the units in which it is normally expressed and the way in which it can be determined. The combination of two separate processes whereby water is lost on the one hand from the soil surface by evaporation and on the other hand from the crop by transpiration is referred to as evapotranspiration (ET). Evaporation is the process whereby liquid water is converted to water vapour (vaporization) and removed from the evaporating surface (vapour removal). Water evaporates from a variety of surfaces, such as lakes, rivers, pavements, soils and wet vegetation. Energy is required to change the state of the molecules of water from liquid to vapour. Direct solar radiation and, to a lesser extent, the ambient temperature of the air provide this energy. The driving force to remove water vapour from the evaporating surface is the difference between the water vapour pressure at the evaporating surface and that of the surrounding atmosphere. As evaporation proceeds, the surrounding air becomes gradually saturated and the process will slow down and might stop if the wet air is not transferred to the atmosphere. The replacement of the saturated air with drier air depends greatly on wind speed. Hence, solar radiation, air temperature, air humidity and wind speed are climatological parameters to consider when assessing the evaporation process. Where the evaporating surface is the soil surface, the degree of shading of the crop canopy and the amount of water available at the evaporating surface are other factors that affect the evaporation process. Frequent rains, irrigation and water transported upwards in a soil from a shallow water table wet the soil surface. Where the soil is able to supply water fast enough to satisfy the evaporation demand, the evaporation from the soil is determined only by the meteorological conditions. However, where the interval between rains and irrigation becomes large and the ability of the soil to conduct moisture to pear the surface is small, the water content in the topsoil drops and the soil surface dries out. Under these circumstances the limited availability of water exerts a controlling influence on soil evaporation. In the absence of any supply of water to the soil surface, evaporation decreases rapidly and may cease almost completely within a few days. Transpiration consists of the vaporization of liquid water contained in plant tissues and the vapour removal to the atmosphere. Crops predominately lose their water through stomata. These are small openings on the plant leaf through which gases and water vapour pass (Figure 1). The water, together with some nutrients, is taken up by the roots and transported through the plant. 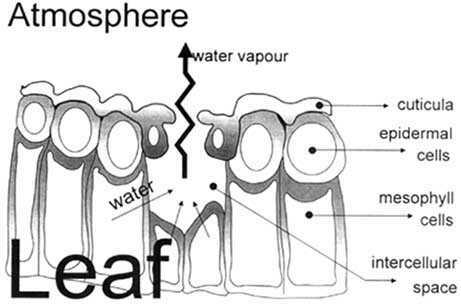 The vaporization occurs within the leaf, namely in the intercellular spaces, and the vapour exchange with the atmosphere is controlled by the stomatal aperture. Nearly all water taken up is lost by transpiration and only a tiny fraction is used within the plant. Transpiration, like direct evaporation, depends on the energy supply, vapour pressure gradient and wind. Hence, radiation, air temperature, air humidity and wind terms should be considered when assessing transpiration. 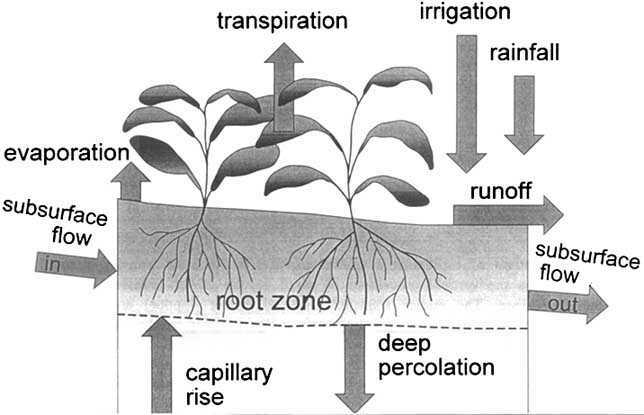 The soil water content and the ability of the soil to conduct water to the roots also determine the transpiration rate, as do waterlogging and soil water salinity. The transpiration rate is also influenced by crop characteristics, environmental aspects and cultivation practices. Different kinds of plants may have different transpiration rates. Not only the type of crop, but also the crop development, environment and management should be considered when assessing transpiration. Evaporation and transpiration occur simultaneously and there is no easy way of distinguishing between the two processes. Apart from the water availability in the topsoil, the evaporation from a cropped soil is mainly determined by the fraction of the solar radiation reaching the soil surface. This fraction decreases over the growing period as the crop develops and the crop canopy shades more and more of the ground area. When the crop is small, water is predominately lost by soil evaporation, but once the crop is well developed and completely covers the soil, transpiration becomes the main process. 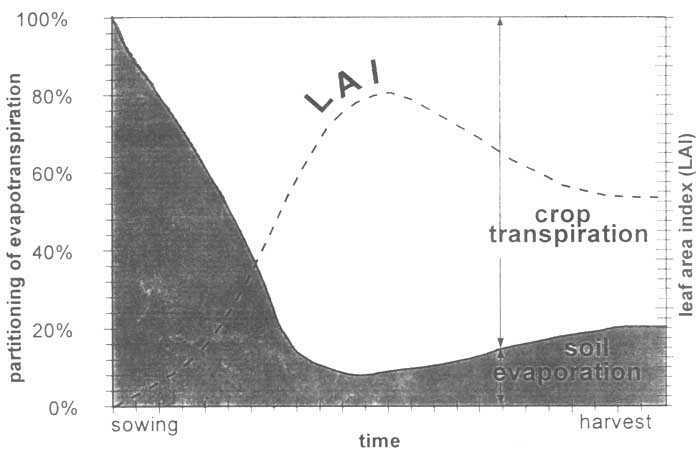 In Figure 2 the partitioning of evapotranspiration into evaporation and transpiration is plotted in correspondence to leaf area per unit surface of soil below it. At sowing nearly 100% of ET comes from evaporation, while at full crop cover more than 90% of ET comes from transpiration. The evapotranspiration rate is normally expressed in millimetres (mm) per unit time. The rate expresses the amount of water lost from a cropped surface in units of water depth. The time unit can be an hour, day, decade, month or even an entire growing period or year. As one hectare has a surface of 10000 m2 and 1 mm is equal to 0.001 m, a loss of 1 mm of water corresponds to a loss of 10 m3 of water per hectare. In other words, 1 mm day-1 is equivalent to 10 m3 ha-1 day-l.
Water depths can also be expressed in terms of energy received per unit area. The energy refers to the energy or heat required to vaporize free water. This energy, known as the latent heat of vaporization (l), is a function of the water temperature. For example, at 20°C, l is about 2.45 MJ kg-1. In other words, 2.45 MJ are needed to vaporize 1 kg or 0.001 m3 of water. Hence, an energy input of 2.45 MJ per m2 is able to vaporize 0.001 m or 1 mm of water, and therefore 1 mm of water is equivalent to 2.45 MJ m-2. The evapotranspiration rate expressed in units of MJ m-2 day-1 is represented by l ET, the latent heat flux. Table 1 summarizes the units used to express the evapotranspiration rate and the conversion factors. * For water with a density of 1000 kg m-3 and at 20°C. On a summer day, net solar energy received at a lake reaches 15 MJ per square metre per day. If 80% of the energy is used to vaporize water, how large could the depth of evaporation be? Weather parameters, crop characteristics, management and environmental aspects are factors affecting evaporation and transpiration. The related ET concepts presented in Figure 3 are discussed in the section on evapotranspiration concepts. The principal weather parameters affecting evapotranspiration are radiation, air temperature, humidity and wind speed. Several procedures have been developed to assess the evaporation rate from these parameters. The evaporation power of the atmosphere is expressed by the reference crop evapotranspiration (ETo). The reference crop evapotranspiration represents the evapotranspiration from a standardized vegetated surface. The ETo is described in detail later in this Chapter and in Chapters 2 and 4. The crop type, variety and development stage should be considered when assessing the evapotranspiration from crops grown in large, well-managed fields. Differences in resistance to transpiration, crop height, crop roughness, reflection, ground cover and crop rooting characteristics result in different ET levels in different types of crops under identical environmental conditions. Crop evapotranspiration under standard conditions (ETc) refers to the evaporating demand from crops that are grown in large fields under optimum soil water, excellent management and environmental conditions, and achieve full production under the given climatic conditions. Factors such as soil salinity, poor land fertility, limited application of fertilizers, the presence of hard or impenetrable soil horizons, the absence of control of diseases and pests and poor soil management may limit the crop development and reduce the evapotranspiration. Other factors to be considered when assessing ET are ground cover, plant density and the soil water content. The effect of soil water content on ET is conditioned primarily by the magnitude of the water deficit and the type of soil. On the other hand, too much water will result in waterlogging which might damage the root and limit root water uptake by inhibiting respiration. When assessing the ET rate, additional consideration should be given to the range of management practices that act on the climatic and crop factors affecting the ET process. Cultivation practices and the type of irrigation method can alter the microclimate, affect the crop characteristics or affect the wetting of the soil and crop surface. A windbreak reduces wind velocities and decreases the ET rate of the field directly beyond the barrier. The effect can be significant especially in windy, warm and dry conditions although evapotranspiration from the trees themselves may offset any reduction in the field. Soil evaporation in a young orchard, where trees are widely spaced, can be reduced by using a well-designed drip or trickle irrigation system. The drippers apply water directly to the soil near trees, thereby leaving the major part of the soil surface dry, and limiting the evaporation losses. The use of mulches, especially when the crop is small, is another way of substantially reducing soil evaporation. Anti-transpirants, such as stomata-closing, film-forming or reflecting material, reduce the water losses from the crop and hence the transpiration rate. Where field conditions differ from the standard conditions, correction factors are required to adjust ETc. The adjustment reflects the effect on crop evapotranspiration of the environmental and management conditions in the field. Distinctions are made (Figure 4) between reference crop evapotranspiration (ETo), crop evapotranspiration under standard conditions (ETc) and crop evapotranspiration under non-standard conditions (ETc adj). ETo is a climatic parameter expressing the evaporation power of the atmosphere. ETc refers to the evapotranspiration from excellently managed, large, well-watered fields that achieve full production under the given climatic conditions. Due to sub-optimal crop management and environmental constraints that affect crop growth and limit evapotranspiration, ETc under non-standard conditions generally requires a correction. The evapotranspiration rate from a reference surface, not short of water, is called the reference crop evapotranspiration or reference evapotranspiration and is denoted as ETo. The reference surface is a hypothetical grass reference crop with specific characteristics. The use of other denominations such as potential ET is strongly discouraged due to ambiguities in their definitions. The concept of the reference evapotranspiration was introduced to study the evaporative demand of the atmosphere independently of crop type, crop development and management practices. As water is abundantly available at the reference evapotranspiring surface, soil factors do not affect ET. Relating ET to a specific surface provides a reference to which ET from other surfaces can be related. It obviates the need to define a separate ET level for each crop and stage of growth. ETo values measured or calculated at different locations or in different seasons are comparable as they refer to the ET from the same reference surface. 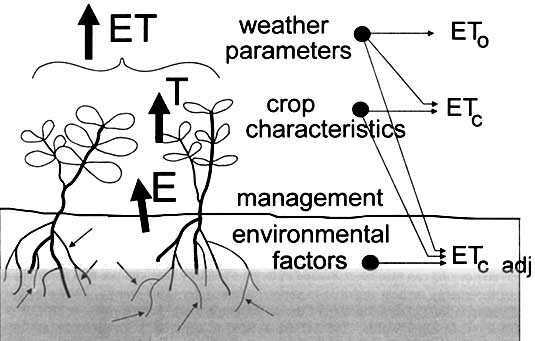 The only factors affecting ETo are climatic parameters. Consequently, ETo is a climatic parameter and can be computed from weather data. ETo expresses the evaporating power of the atmosphere at a specific location and time of the year and does not consider the crop characteristics and soil factors. The FAO Penman-Monteith method is recommended as the sole method for determining ETo. The method has been selected because it closely approximates grass ETo at the location evaluated, is physically based, and explicitly incorporates both physiological and aerodynamic parameters. Moreover, procedures have been developed for estimating missing climatic parameters. Typical ranges for ETo values for different agroclimatic regions are given in Table 2. These values are intended to familiarize inexperienced users with typical ranges, and are not intended for direct application. The calculation of the reference crop evapotranspiration is discussed in Part A of this handbook (Box 1). The crop evapotranspiration under standard conditions, denoted as ETc, is the evapotranspiration from disease-free, well-fertilized crops, grown in large fields, under optimum soil water conditions, and achieving full production under the given climatic conditions. This chapter introduces the user to the need to standardize one method to compute ETo from meteorological data. The FAO Penman-Monteith method is recommended as the method for determining reference ETo. The method and the corresponding definition of the reference surface are described. The FAO Penman-Monteith method requires radiation, air temperature, air humidity and wind speed data. Calculation procedures to derive climatic parameters from the meteorological data are presented. Procedures to estimate missing meteorological variables required for calculating ETo are outlined. This allows for estimation of ETo with the FAO Penman-Monteith method under all circumstances, even in the case of missing climatic data. The calculation of ETo by means of the FAO Penman-Monteith equation, with different time steps, from the principal weather parameters and with missing data is described. The determination of ETo from pan evaporation is also presented. This chapter introduces the user to the 'Kc ETo' approach for calculating crop evapotranspiration. The effects of characteristics that distinguish field crops from the reference grass crop are integrated into the crop coefficient Kc. Depending on the purpose of the calculation, the required accuracy, the available climatic data and the time step with which the calculations have to be executed, a distinction is made between two calculation methods. This chapter presents the first calculation method for crop evapotranspiration whereby the difference in evapotranspiration between the cropped and reference grass surface is combined into a single crop coefficient (Kc). This chapter presents the other calculation method for crop evapotranspiration. Kc is split into two separate coefficients, one for crop transpiration (i.e., the basal crop coefficient Kcb) and one for soil evaporation (Ke). The amount of water required to compensate the evapotranspiration loss from the cropped field is defined as crop water requirement. Although the values for crop evapotranspiration and crop water requirement are identical, crop water requirement refers to the amount of water that needs to be supplied, while crop evapotranspiration refers to the amount of water that is lost through evapotranspiration. The irrigation water requirement basically represents the difference between the crop water requirement and effective precipitation. The irrigation water requirement also includes additional water for leaching of salts and to compensate for non-uniformity of water application. Calculation of the irrigation water requirement is not covered in this publication, but will be the topic of a future Irrigation and Drainage Paper. Crop evapotranspiration can be calculated from climatic data and by integrating directly the crop resistance, albedo and air resistance factors in the Penman-Monteith approach. As there is still a considerable lack of information for different crops, the Penman-Monteith method is used for the estimation of the standard reference crop to determine its evapotranspiration rate, i.e., ETo. Experimentally determined ratios of ETc/ETo, called crop coefficients (Kc), are used to relate ETc to ETo or ETc = Kc ETo. Differences in leaf anatomy, stomatal characteristics, aerodynamic properties and even albedo cause the crop evapotranspiration to differ from the reference crop evapotranspiration under the same climatic conditions. Due to variations in the crop characteristics throughout its growing season, Kc for a given crop changes from sowing till harvest. The calculation of crop evapotranspiration under standard conditions (ETc) is discussed in Part B of this handbook (Box 2). The crop evapotranspiration under non-standard conditions (ETc adj) is the evapotranspiration from crops grown under management and environmental conditions that differ from the standard conditions. When cultivating crops in fields, the real crop evapotranspiration may deviate from ETc due to non-optimal conditions such as the presence of pests and diseases, soil salinity, low soil fertility, water shortage or waterlogging. This may result in scanty plant growth, low plant density and may reduce the evapotranspiration rate below ETc. The crop evapotranspiration under non-standard conditions is calculated by using a water stress coefficient Ks and/or by adjusting Kc for all kinds of other stresses and environmental constraints on crop evapotranspiration. The adjustment to ETc for water stress, management and environmental constraints is discussed in Part C of this handbook (Box 3). Evapotranspiration is not easy to measure. Specific devices and accurate measurements of various physical parameters or the soil water balance in lysimeters are required to determine evapotranspiration. The methods are often expensive, demanding in terms of accuracy of measurement and can only be fully exploited by well-trained research personnel. Although the methods are inappropriate for routine measurements, they remain important for the evaluation of ET estimates obtained by more indirect methods. This chapter discusses the reduction in transpiration induced by soil moisture stress or soil water salinity. The resulting evapotranspiration will deviate from the crop evapotranspiration under standard conditions. The evapotranspiration is computed by using a water stress coefficient, Ks, describing the effect of water stress on crop transpiration. Procedures that can be used to make adjustments to the Kc to account for less than perfect growing conditions or stand characteristics are discussed. The procedures can also be used to determine Kc for agricultural crops not listed in the tables of Part B. This chapter discusses various types of management practices that may cause the values for Kc and ETc to deviate from the standard conditions described in Part B. Adjustment procedures for Kc to account for surface mulches, intercropping, small areas of vegetation and management induced stress are presented. This chapter describes procedures for predicting ETc during non-growing periods under various types of surface conditions. Evaporation of water requires relatively large amounts of energy, either in the form of sensible heat or radiant energy. Therefore the evapotranspiration process is governed by energy exchange at the vegetation surface and is limited by the amount of energy available. Because of this limitation, it is possible to predict the evapotranspiration rate by applying the principle of energy conservation. The energy arriving at the surface must equal the energy leaving the surface for the same time period. where Rn is the net radiation, H the sensible heat, G the soil heat flux and l ET the latent heat flux. The various terms can be either positive or negative. Positive Rn supplies energy to the surface and positive G, l ET and H remove energy from the surface (Figure 5). In Equation 1 only vertical fluxes are considered and the net rate at which energy is being transferred horizontally, by advection, is ignored. Therefore the equation is to be applied to large, extensive surfaces of homogeneous vegetation only. The equation is restricted to the four components: Rn, l ET, H and G. Other energy terms, such as heat stored or released in the plant, or the energy used in metabolic activities, are not considered These terms account for only a small fraction of the daily net radiation and can be considered negligible when compared with the other four components. The latent heat flux (l ET) representing the evapotranspiration fraction can be derived from the energy balance equation if all other components are known. Net radiation (Rn) and soil heat fluxes (G) can be measured or estimated from climatic parameters. Measurements of the sensible heat (H) are however complex and cannot be easily obtained. H requires accurate measurement of temperature gradients above the surface. Another method of estimating evapotranspiration is the mass transfer method. This approach considers the vertical movement of small parcels of air (eddies) above a large homogeneous surface. The eddies transport material (water vapour) and energy (heat, momentum) from and towards the evaporating surface. By assuming steady state conditions and that the eddy transfer coefficients for water vapour are proportional to those for heat and momentum, the evapotranspiration rate can be computed from the vertical gradients of air temperature and water vapour via the Bowen ratio. Other direct measurement methods use gradients of wind speed and water vapour. These methods and other methods such as eddy covariance, require accurate measurement of vapour pressure, and air temperature or wind speed at different levels above the surface. Therefore, their application is restricted to primarily research situations. Some fluxes such as subsurface flow, deep percolation and capillary rise from a water table are difficult to assess and short time periods cannot be considered. The soil water balance method can usually only give ET estimates over long time periods of the order of week-long or ten-day periods. By isolating the crop root zone from its environment and controlling the processes that are difficult to measure, the different terms in the soil water balance equation can be determined with greater accuracy. This is done in lysimeters where the crop grows in isolated tanks filled with either disturbed or undisturbed soil. In precision weighing lysimeters, where the water loss is directly measured by the change of mass, evapotranspiration can be obtained with an accuracy of a few hundredths of a millimetre, and small time periods such as an hour can be considered. In non-weighing lysimeters the evapotranspiration for a given time period is determined by deducting the drainage water, collected at the bottom of the lysimeters, from the total water input. A requirement of lysimeters is that the vegetation both inside and immediately outside of the lysimeter be perfectly matched (same height and leaf area index). This requirement has historically not been closely adhered to in a majority of lysimeter studies and has resulted in severely erroneous and unrepresentative ETc and Kc data. As lysimeters are difficult and expensive to construct and as their operation and maintenance require special care, their use is limited to specific research purposes. Owing to the difficulty of obtaining accurate field measurements, ET is commonly computed from weather data. A large number of empirical or semi-empirical equations have been developed for assessing crop or reference crop evapotranspiration from meteorological data. Some of the methods are only valid under specific climatic and agronomic conditions and cannot be applied under conditions different from those under which they were originally developed. Numerous researchers have analysed the performance of the various calculation methods for different locations. As a result of an Expert Consultation held in May 1990, the FAO Penman-Monteith method is now recommended as the standard method for the definition and computation of the reference evapotranspiration, ETo. The ET from crop surfaces under standard conditions is determined by crop coefficients (Kc) that relate ETc to ETo. The ET from crop surfaces under non-standard conditions is adjusted by a water stress coefficient (Ks) and/or by modifying the crop coefficient. Evaporation from an open water surface provides an index of the integrated effect of radiation, air temperature, air humidity and wind on evapotranspiration. However, differences in the water and cropped surface produce significant differences in the water loss from an open water surface and the crop. The pan has proved its practical value and has been used successfully to estimate reference evapotranspiration by observing the evaporation loss from a water surface and applying empirical coefficients to relate pan evaporation to ETo. The procedure is outlined in Chapter 3.